It seems that a great many people don’t like to write, and I find that amazing. Whether I’m writing a letter, an email, a blog post or a grocery list, there is nothing that comes more easily to me (as my patient readers have discovered). That doesn’t mean I’m a good writer; plenty of people who are exceptionally good writers, including my husband and older son, don’t write nearly as much or as often as I do — though I wish they did. And plenty of us who write reams will never be numbered among the gifted, or even the widely published. It’s still a wonderful exercise for the mind, heart and soul. I agree with Lewis that writing is therapeutic. It benefits the writer, and in some cases, it also benefits those who read the writing. In fact, it can even benefit those who never read it. I have often written poems, stories and letters that I never intended anyone to read. In doing so, I have unburdened myself without unduly burdening others. Thus my unread writings may have benefited those who know me, whether they realize it or not. I’m sure many others could say the same. But sometimes we have the great good fortune of encountering an author who loves to write, and is very good at doing it. Such writers somehow convey their joy in the writing process without ever mentioning it. Their fluid pace or razor-sharp descriptions imply years of close acquaintance with pen and ink. 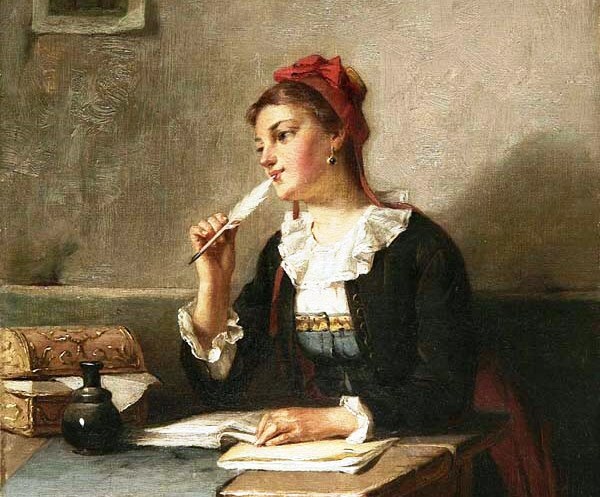 The act of writing surely served a helpful or joyful end in their own lives, but its greatest contribution by far lies in the untold numbers of people who are led to ponder, rejoice, laugh or cry at the bits of life that have been translated into words through ink coupled with imagination. If you’re feeling fed up, remember the wise words of my favorite author. Ink (even the electronic version of it) is a great cure. Spend a few minutes confiding your thoughts to a paper or screen. Promise yourself that you can burn, erase or delete anything you don’t want anyone else to see. Then start. You might be surprised how much it will help. Julia, I was just thinking of you and the family this morning. I pray all is well and Matt and Jeff are doing good. You are always in my prayers. I love reading, but don’t write as often as I used to. Maybe I will pick up a pen and start today. Thank you for being here. Thanks Cherie, we are doing OK. This morning was one of those “out-of-sync” times for both Matt and me, but we managed to get through it and get the day underway. Reading can be as therapeutic as writing, so both are worthwhile pursuits. But I do find that there is something about writing that can calm my brain at times when I’m too distracted to focus on reading. Hope you have a wonderful day today — thanks to YOU too, for being here! I loved the quote and have saved it. You are spot on. I’ve learned so much about the act of writing over the years. I write daily, Badly, but daily. I journal each and every day without fail. When something is especially troubling, I sit with another notebook. Have more notebooks than a stationary store. I have also learned that the art or remembering is enhanced by writing it. A teacher years ago made us copy the text from the blackboard into notebooks then rewrite it onto unlined paper with fountain pens into another notebook. No textbooks were passed out to us. By the time you have written it twice, you remember the information far better than just re-reading it over and over. It’s that way with things I want from life. I list things on paper. Clearly and concisely. That act of writing with a pencil or pen changes something in the brain and registers it. I have checked all those things on my list off. It amazes my daughter but still, she doesn’t write. Both kids have Disgraphia. I hadn’t heard of it before. They take the information in, but can’t write it back out. It’s actually painful for them to take notes unless they have plenty of time. As a result they rarely tested well. Both are extremely bright but won’t write. Boy do they read though. I’m with you on the writing thing. I’d spend more time doing it if I could. Marlene, that’s one more thing we have in common. I think it’s fairly obvious (to me, anyway) that am hypergraphic, a term I didn’t know about until I read the book The Midnight Disease by Alice Flaherty. It’s fascinating how differently some people are wired than others. Literacy, whether reading or writing, really did change the human brain as it became widespread and vernacular languages developed. Daniel Boorstin has an excellent review of that in his book The Discoverers, in a chapter entitled “The Lost Arts of Memory.” Words and languages have always been spellbinding to me. I remember in school having to copy our science and social studies charts as you described (though we only had to do it once) as a means of learning the information. It does make a difference. Even keyboarding is different from cut-and-paste in terms of helping us to remember what we read. But some of us just seem born to love writing quite aside from all its benefits. I like to carry a pen and note paper with me wherever I go. I know I can now record reminders vocally using a smart phone, but to me, it’s just not the same. I too love to write but don’t do it nearly as much as I should. I maintain that it is lovely to get a card or a letter written out by someone. Even if it is just a few words. I plan with my new job to write something every day. In the mean time I am soaking up the time reading. I love to read. My love to the boys. I must find out about this new job! I’m intrigued. I sent you an email earlier — sorry I did not get yours in time for us to get together this week. One thing I have always loved about you is that you read even more than I do. 😀 And yes, a handwritten card is way different from an email, though I love the advantages of its ease and immediacy. A handwritten card goes to a different part of my brain, I think. The part that loves to sit and sip a cup of tea. Carolyn, I am so happy all the news was great!! And I too hope and pray that you will have the rest of the year free of medical procedures. They are the sort of modern blessing that it’s difficult to stay grateful for over a period of many months. Jeff is doing pretty well. He has had to miss several chemo treatments due to having white blood counts hovering around 1 (!) but they cut him back to a 50% dosage this week and we’ll hope that is enough to keep the lung tumors at bay. Hope you have a nice and restful weekend coming up! Sheila, I’m so glad you enjoyed the note! It was fun to send it too. Thanks so much for your kind words about the blog. I hope y’all have a great weekend! au contraire Julia, you are one of my favourite writers here at WordPress. As you’ve just written this diddy, “people who are led to ponder, rejoice, laugh or cry at the bits of life that have been translated into words through ink coupled with imagination.” Poetic yet to your point. K, thanks for your sweet comments about the blog. I really appreciate your steadfast encouragement. I do agree that personalities certainly come out in a blog, especially after we get used to blogging. I don’t think your blog is silly, it’s just fun! We all need a good dose of fun. I hadn’t thought about it as reporting but I do feel that I know far more about Edmonton than I used to…especially since I used to know ZERO beyond that it was located somewhere in Canada! I think a good percentage of bloggers make a conscious effort for their blogs to be encouraging in some way. That’s partly what sets them apart from other forms of news, which PRETENDS to be impartial even though that has become less so over the years. Bloggers can say whatever they want and most of us know that a blog is not meant to be an encyclopedic source of fact-checked info. It’s just more relaxed, like a conversation. Plus it’s so much more fun to read the content when you come to know the blogger. Prior to the internet, it was usually not possible to correspond directly with an author, even if they are gracious enough to answer all their mail (which gets very hard as they get more famous). Blogs are like a big open house where everyone is welcome and people can drop in and out as they are able. It’s a form of social interaction that we previously could not have really imagined. My first exposure to anything like it was a text-based “listserv” back in the Unix days of the internet, when I discovered a wonderful group of school librarians online sharing their ideas and info from all over the world. My association with them led to my having a job immediately after I graduated and we moved to San Antonio. A librarian on the listserv had told me about the opening and I interviewed and took the job the same week I arrived in town. Oh, thank you Alan, that’s such a lovely thing to say. Those who know us well might tell you that “peace” is not the first word that comes to mind when they think of our family 😀 but despite our differences in personality, I do think that all in all, we have a fairly quiet and restful home. I’m so happy you like to write, too, and grateful for your presence here! Have a wonderful weekend. Raynard it sounds as if you are getting in plenty of reading time without going to the library. Nowadays we can bring the library to ourselves with the computer, which is why I like to encourage people to learn at least a little bit about how to connect with it online. It’s one of the greatest bargains around! I’m not sure whether I should get excited about Windows 10 or not. About the time I get used to one version of Windows, they bring out another one. You’ll have to let me know how great it is since I probably won’t jump at the supposedly free upgrade the will be giving everyone. Thank the Lord for this day and for all that is in it. My times are in His hand. My soul rests with Him, my Anamchara. I just simply believe that God is blessing me even when I don’t have a feeling of being blessed. You see I suffer from a disposition problem and lots of times I am just a sourpuss and so far from feeling God’s blessedness, it’s unbelievable. I might pray for a sweet disposition but I’m afraid I couldn’t stand myself very long in that state. So I think I’ll just be. I’m pretty sure that’s okay with God as I understand him. After all don’t they say that God can draw a straight line with a crooked stick? Thank you Harry, I think a good many of us have a disposition problem at least some of the time. If you think about the most famous Bible characters, a good many of them were not what we would think of as “positive thinkers” — in fact, a lot of them became heroes most reluctantly. David might be an exception, but a quick look at the Psalms would indicate that his disposition was uneven at best. So you are in good company! Good morning, Julia! You’re right (again). Lewis is right (again). Recently I experienced a “human ill” in the form of an accident. So many people asked me “what happened” and I noticed that I was altering my response to suit the audience. It wasn’t until I took a break to write it all down (15 seconds of action in 3 hours of writing, ha!) that I was able to understand what happened. No one’s read it yet, but it’s helped me to tell the story better, even if the telling is tailored to the audience. Susan, it’s very astute of you to notice that you were tailoring your responses — I think we all do that, but some of us don’t even realize it. Over the years of advocating for Matt in a variety of situations, I’ve learned that putting things in writing is absolutely essential to clear communication. So often, we come away from a casual conversation with different understandings about what was agreed upon (as almost all couples can attest, hee-hee) and I think writing protects ALL parties, though some find it intimidating. I think it’s fascinating to read the many recent research studies about the variability in how different people see the same incident, and also in the way the same person might remember things over time. Thanks for making this important point — yet another way writing can be our friend. You are an excellent and inspiring writer Julia, and I’m impressed (but not surprised) that it comes out easily for you. I like writing every now and then although I’m not good at it. Thoughts or a few rhyming phrases usually jump into my mind specially when I’m feeling down! Oh, thanks so much for your kind words — they really do mean a great deal to me. Each of us has things we can do more easily. It amazes me how some people can cook, whipping up delicious meals with seemingly none of the mistakes I tend to make. Sometimes writing seems like an impractical thing to be able to do without effort, but I try to find ways to make it useful, so it means a lot when people say my writing has helped them in some way. I think anybody who writes a lot is bound to get better at it, if only from practice. That’s funny you mention about the rhyming phrases; I have always had a sort of tendency to make up silly rhymes, but it seemed to me more of a neurological glitch than anything else. However, it came in handy when I had young children. 🙂 I can remember things much more easily if I can make up a rhyme or song about them. Yet another tidbit we share: I write notes while emotionally hurt & ask God to forgive the person & me, put them in a drawer, never intending for anyone to read. I had not thought of it being cathartic, now I see it is! Your writings fill me with joy! Your sentence structure & word choices are indeed a boon for your readers. Love to “my” Dentons! Mary Ann, I think it’s a great idea to write things out and never send them. I’ve done that many times online as well as in print. For some of us, it is a way of making sense of things (including our own, often overwrought emotions) and grieving what can’t be changed. Thanks so much for your kind words about my writing! It’s such a joy to me if any of my rambling thoughts are helpful to someone. Sending love and smiles your way!